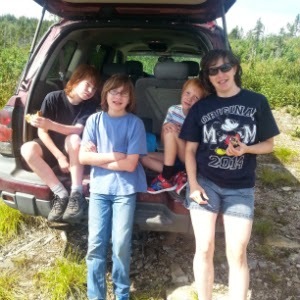 On Saturday I took the three boys blueberry picking. I'd been wanting to get out for about a week, since I'd started hearing reports of the thousands (or billions, depending on who you asked) of berries just waiting to be picked. There are always other people around when we're picking berries and I find it interesting to observe how different people approach the process. Some wander around, picking for a little while from one patch and then moving on to pick some from the next patch and on and on like that. Others hunker down and pick every single berry in a given spot before they'll even think about moving. Nathan picks enough to almost cover the bottom of his little container, then takes a break from picking to eat them all, wanders off to see who he can talk to and repeats that until it's time to go home. "Oh, how I love your law! I meditate on it all day long" (Psalm 119:97). If we are going to be thinking about, or meditating on, God's word, then we must be reading our Bibles or we won't have much to think about. "I have more insight than all my teachers, for I meditate on your statutes" (Psalm 119:99). Knowing our Bibles will certainly lead to wisdom and insight, especially if we also think about what we read throughout the rest of our day. "Do your best to present yourself to God as one approved, a worker who does not need to be ashamed and who correctly handles the word of truth" (2 Timothy 2:15). This letter was written to a young pastor, but I think it applies equally to any believer. We should all be capable of talking (or writing!) about the Bible without distorting what it says. "But as for you, continue in what you have learned and have become convinced of, because you know those from whom you learned it, and how from infancy you have known the Holy Scriptures, which are able to make you wise for salvation through faith in Christ Jesus. All Scripture is God-breathed and is useful for teaching, rebuking, correcting and training in righteousness, so that the servant of God may be thoroughly equipped for every good work" (2 Timothy 3:14-17). 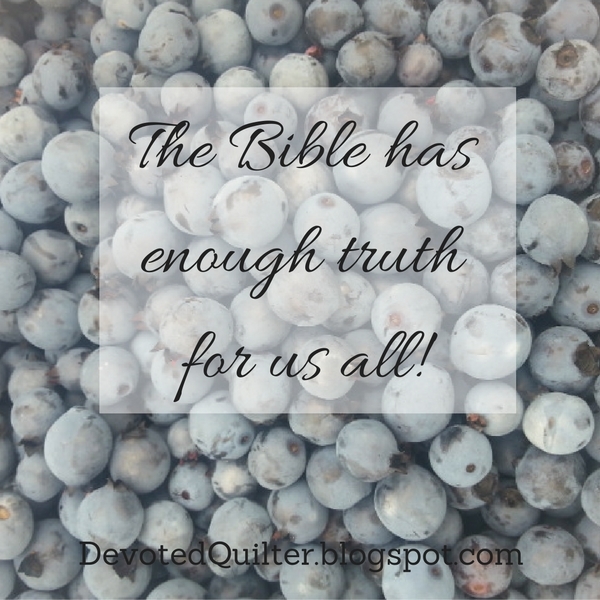 So, how can I compare reading the Bible with picking blueberries? Sometimes I want to know what the Bible says about a particular subject, so I browse around reading a verse here and a verse there. Usually I use a search on Google or in a Bible concordance to find the verses I'm looking for. I also read a little before and a little after the verse to get an idea of the context so I can understand the verse more fully. This is the method I often use when I'm writing these devotions. I know the Bible says something about a particular topic, and usually I know some or all of a couple of verses about it, but I'll search to see if there are other verses I didn't immediately think of. Searching for other verses, and reading before and after the selected verse, also helps make sure I'm not twisting the verses to make them say what I want them to say, rather than sticking to what they actually do say. Other times I want to get a deeper understanding of one book of the Bible. I read it from beginning to end, slowly, over several days unless it's a short book. I reread the parts that don't make sense. There are often lots of those and sometimes I still can't make sense of them after a second or even a third reading. I think my favourite Biblical book is Romans, but boy, is it tough to read! There are sections I have to read out loud just so I can pause at the right times and help myself follow what is being said. It's tough, but most definitely worth the effort. When I'm confused, I sometimes ask my husband for his opinion, or I look in one of the commentaries we own, or I search online for explanations. We also own quite a few Bible study books, so sometimes I'll work through a book while reading a study book at the same time. Before you get too impressed with how incredibly devoted I am to my Bible reading, now might be a good time to confess that I haven't been following my regular reading schedule since summer vacation started, even though I had good intentions of continuing after school ended. We're back to regular routine tomorrow, though, and returning to those early morning sessions with my Bible is the best thing about summer being over. There's one other comparison I can make between picking berries and reading the Bible. On Saturday there was a lady from our church picking berries in the same area as we were. Every now and then she'd call out to us "There are lots of them over here! Big ones too!" She knew she didn't have to hoard those good patches to herself because there were more berries around than all of us together would be able to pick, so she was generous in sharing what she found. Likewise, the Bible has enough truth for us all, more than we'll ever be able to glean from it in a lifetime of study. Sharing what we find in its pages will never diminish what we have, but will certainly enrich those we share with. So, what is your Bible study personality? Do you browse, dig in deep or a bit of both and do you share what you find?